While your guests will certainly be stuffing themselves with turkey and sides, everyone always leaves room for desserts at Thanksgiving. Go traditional with a pumpkin or pecan pie, mix it up with a decadent fall cake or cupcakes, or impress with a completely unexpected sweet treat. From bars to cookies to cobblers, there's no shortage of Thanksgiving desserts to add to your table, so don't just stop at one. Sweet potato pie is a Southern classic and it's easy to make with a few simple ingredients. Like pumpkin pie, it's especially good topped with a dollop of fresh whipped cream. Get the flavors of pie without the hassle of a crust with this buttery sweet crisp. Use a variety of apples for the filling and add nuts to the crunchy topping if desired. Serve warm with vanilla or cinnamon ice cream. Few ingredients conjure up cozy holiday feeling like cranberries and the little berries are the star of this bright red, sweet-tart pie. Make your own crust the day before, or use store-bought dough if you're in a pinch. Lightly spiced and moist, pumpkin cake is an ideal fall treat and it doesn't get easier than a sheet cake. Make it party-worthy by slicing into individual squares and topping with a decadent cream cheese frosting. Covered in popcorn and a luscious salted caramel sauce, this showstopping cheesecake is sure to wow at your Thanksgiving meal. Use graham cracker crumbs if you don't have digestive biscuits on hand. For a stunning dessert centerpiece that's deceivingly easy to make, serve a cake roll. Spiced with cinnamon and nutmeg and filled with cream cheese frosting, this fall version tastes as good as it looks. It's also a great way to use up leftover mashed sweet potatoes after Thanksgiving! Spices like cinnamon, cardamom, and ginger pair perfectly with pear, and all together they form this stunning pie. The spices go directly into the pie crust and the pears cook down in a nutty caramel sauce for an extra punch of flavor. Warm spiced cookies get even better topped with a caramel icing, and are a fun alternative to pumpkin pie. Serve with coffee, warm apple cider, or hot cocoa. A German chocolate layer cake made from scratch is worthy of Thanksgiving. The moist, decadent cake is covered in a sweet, pillowy coconut and pecan frosting that no one will be able to resist. Hand pies are cute, easy to eat (even for kids! ), and even easier to make. Make your crust and filling ahead to save prep time on Thanksgiving Day. A cobbler is a unique take on a Thanksgiving sweet potato dish, with a tender sweet topping and a buttery filling of the quintessential autumn ingredient. Molasses, brown sugar, cinnamon, and ginger flavor these chewy crinkle cookies. Top with turbinado or another kind of large-grained sugar for a pretty crystalized affect. Worthy of a pastry case, a French apple tart starts with a flaky crust that's then filled with pastry cream and carefully finished with thinly sliced apples in a fan design. Made with buttermilk and brown sugar, these cupcakes are wonderfully soft and flavorful. The frosting has just enough maple flavor without being overpowering. Tart, bright-red cranberries taste and look festive on an easy-to-make upside down cake. Serve topped with cream or a custard sauce. You simply cannot go wrong with a pecan pie at Thanksgiving and luckily it's one of the more forgiving pies to make. Whip up your own pie dough or buy pre-made to save some precious time. Creme brulee is always an impressive dessert and wins over the pickiest of eaters. These individually-sized desserts only call for a few ingredients and can be made before dinner. Torch tableside just before serving to truly impress. With a custard-like chocolate filling and whipped cream topping, this pie will satisfy the cocoa lovers coming over for dinner. Somewhere between a crisp and a cobbler, this spiced apple crunch is especially tasty when served warm with ice cream. Not feeling like pumpkin pie this year? 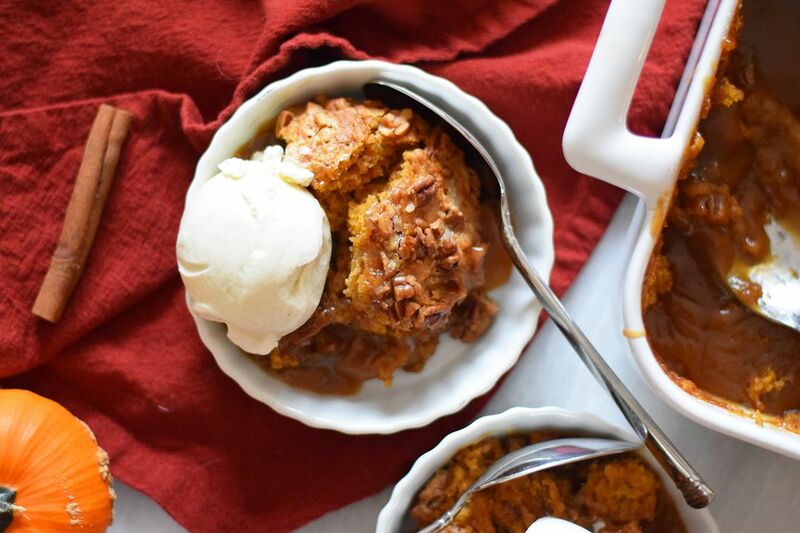 Mix it up with this luscious pumpkin cobbler topped with a crunchy pecan topping and a decadent caramel sauce underneath. All of the flavors of pecan pie are in this festive layer cake finished with toasted pecans and a simple buttercream. Satisfy the gluten-free crowd—and everyone else, for that matter—by offering a simply delicious sweet potato custard. The holiday season is also citrus season, making it the ideal time to make a Key Lime pie. Whether you make your own graham cracker crust or not, the recipe is super easy to pull together. A snap to make, you can customize these pumpkin cookies however you like. Add nuts, dried fruit, candied ginger, or chocolate chips. Tart cranberries and sweet pears pair wonderfully together for a crumble-topped pie. It'll please vegans and non-vegans alike. A classic British dessert, sticky toffee pudding is filled with sweet, chewy dates and smothered in a gooey sauce. Make this ultra-creamy and rich cheesecake in your electric pressure cooker, freeing up your stovetop and oven for other Thanksgiving dishes. The pecan topping makes it a nice fit for the holidays. The tart apples and cranberries are balanced by the sweet, pillowy topping in this classic cobbler. Serve warm, reheating in the oven if needed. Naturally sweet, butternut squash is a versatile winter squash that can play up sweet or savory. Top these cupcakes with homemade orange buttercream to make it a truly seasonal treat. Mock apple pie date back to the 1800s and became a common way to make a tasty pie without the need for apples. It has all of the flavors you're looking for without the fruit, a handy recipe to keep on hand for those last-minute dessert rushes. A pie that makes its own crust? Talk about easy. Make this tropical-inspired custard pie ahead so that it has plenty of time to cool. Melt-in-your-mouth, buttery shortbread is not a bad way to end a meal, especially when the cookies are studded with toasted pecans. Combine two classic Thanksgiving pies into one delectable pie. Creamy, spiced sweet potato is topped with a crunchy, sweet pecan topping for a dreamy mashup everyone will be talking about. Warm bread pudding is always a good cold-weather treat, especially when everyone gets their own topped with butterscotch sauce. Somewhere between a pie and a cobbler, this pear dessert is made entirely on the stovetop so the oven can work on the turkey and sides. A pretty bundt cake is perfect for feeding a crowd and is especially easy when you use a cake mix. The built-in topping of pecans and brown sugar gives it a little crunch. Creamy and rich, this super fast and easy take on pumpkin pie is a no-brainer during the busy holiday season. Let chill for a few hours before serving. Fresh apples, walnuts, and spices are what make these bars extra special. Drizzle a little caramel sauce on top for a little extra sweetness. 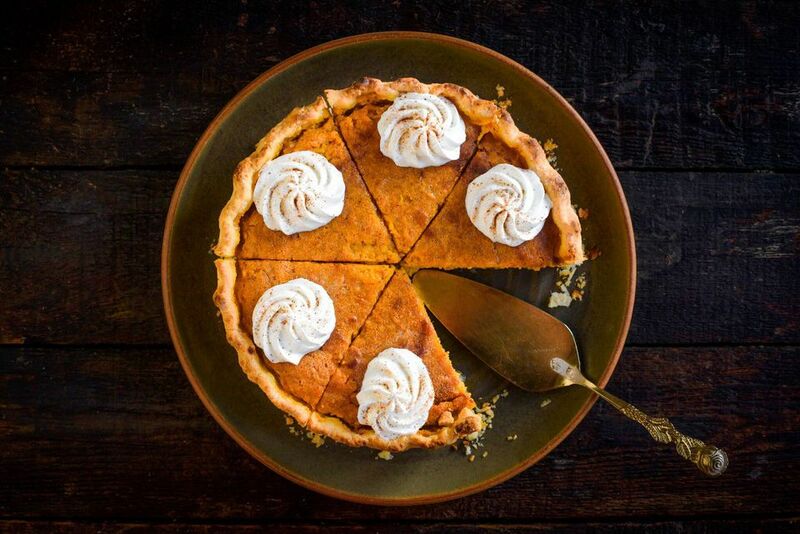 Nothing is more classic Thanksgiving than pumpkin pie. Perfectly spiced with a custardy texture, it doesn't get much better than this—maybe just some whipped cream. These tiny pecan pies can be eaten like cookies and look lovely arranged on a platter. Plan head so that your crust and filling have time to cool. Better yet, make them the day before for even less stress.